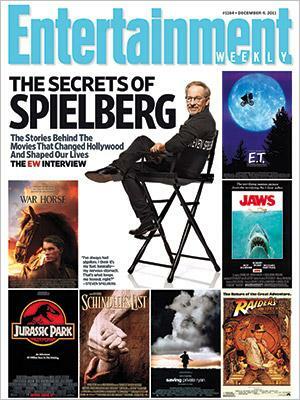 In the current issue of Entertainment Weekly, their feature article is "The Secrets of Spielberg" where Steven Spielberg talks about a range of topics including Transformers. The interview, help promote The Adventures of TinTin (exec producer) and War Horses (director), is a retrospective of Spielberg's long career as he answers questions and provides stories about his many movies, especially those he directed. The Transformers part is brief but he mentions that playing with the toys inspired him to do a movie, that he wants Bay back and he did not ask for Megan Fox to get fire. Spielberg: I used to buy my kids Transformers toys, and I'd wind up on the floor playing with them. I called up the head of Hasbro and I said, "Will you sell me the rights to Transformers? I think I have a way of turning this into a motion picture." Will there be another Michael Bay Transformers? I hope so, because I think he made the best of the three with the last one. I certainly can't imagine anybody other than Michael being equipped to make another Transformers. He's invented a genre, and he's got the secret formula. He told GQ that when Megan Fox compared him to Hitler in an interview, you said that he should fire her. [Shakes head] That's not true. That didn't happen. Update: Speaking of Michael Bay, the director briefly commented on his potential return to franchise saying while in Singapore for the launch of Transformers: The Ride. "How did I know someone's going to ask me this question today? We're talking about it, but there's nothing right now. I'm going to do a tiny movie first, then we'll talk about it, if I potentially do it." I don't know what is the situation between Megan Fox and Michael Bay, but I really want her come back in 4 part. @Download Transformers: If Michael Bay is back he will never get Megan Fox back. And Transformers4 will be a bad movie just like Transformers3. A lot of people disliked Transformers3 despite boxoffice profits inflated by higher 3D prices anyway. The "Michael Bay magic formula" might be over with Transformers4. It all depends on how many people want another Michael Bay movie that he does only for money and nothing else. Because Transformers3 really is the worst Michael Bay movie to date, he messed up everything from plot to characters, he destroyed the magic he created with the first two movies. 3) Give outstanding CGI and action scenes like on Transformers2 but bigger, 3-4 Gestalts/Combiners and city-sized Transformers. Anything else is going to be a failure despite how many fools the marketing machine might be able to steal money from. I guarentee Bay does the next one, because at first he said he definately is not going to do anymore trans movies and now he's talking about doing it again. Folks thats all you need to know, the man is comming back, so we know half the movie will be goofy and doofy and the other half will be non stop orgasim of the senses while your head is stuck in a bucket of popcorn because Ican't see Bay changing his approach, what say you? DUmbasses its called "TRANSFORMERS" not "JENIFERS BODY"
@Anonymous 12/03/2011 6:34 PM: here the only retarded one looks like its you. No more Michel Bay and no more megan fox, its time for a fresh new start enough of dumb models and dorky comdey. I'm all for another Bay Transformers. He is the man that brought it all back and he has done a fantastic job so far. So why not stop? Sure he needs a break and he has been wanting to do this "tiny movie" for years now. he deserves it. He's all transformers-out at the moment. I dont have a problem with the designs, action sets, stunts, explosions and special effects, the problem I have with Bay's approach is he has a problem with a cohesive storyline and way too much goofy doofy toilet humor and not enough death matches between different bots and not nearly enough transformations and a real good story with much more character development.To me thats where he lacks, if he can do those things, more death matches, more transformations, better character development and get rid of the doofyness, people would respond in a positive way with excitement, but after 3 movies I don't know if he will ever change his approach... See I commented without calling anyone names, aint that something. I agree 95%, the design for Q was a joke he looked like crap in robot form also I didn't like Soundwave being a car. Bay also needs to STOP INVENTING HIS OWN TRANSFORMERS, the Twins and Dreeds just to name two were a waste of movie money when he could've used any other Transformers that we all know and want to see! @12/04/2011 1:21 PM: Transformers3 is a joke of a movie, they did it to cash in spending the least possible amount of money. They re-used most CGI models just tweaking them a bit here and there to create new ones. The Drill bot was a pathetic waste of screentime. From Bay one would have expected something huge like Pearl Harbor for the 3rd movie, but Transformers3 is worse than all previous Michael Bay movies to date. If they really wanted to deliver quality they would have had Combiners fighting downtown Chicago with the population in and showing Decepticons killing people and people getting killed as skyscrapers collapsed under the attack. From Michael Bay I was expecting to see outstanding Decepticons Vs Autobots fightings inside buildings.. like for example inside a skyscraper from bottom to top and people inside it getting involved as the building gets damaged and burns... with really amazing visuals like never seen before. Not the lame cheap green-screen fake scene of the broken skyscraper Michael Bay did on Transformers3 with the lame Drill bot that took ages to destroy that tiny building, that looked really lame and not cool. For 14 months you said DOTM would fail, all because Mikayla (Megan Fox) wasn't in it. When it didn't fail, you blamed the movies success on Paramount's marketing. Most people, including a lot of industry insiders raved about DOTM's CGI and 3-D, but according to you the CGi and 3-D in DOTM was terrible. I guess your's is the only opinion that matters and when you spend time trying to correct others you're really just trying to save us poor, stupid souls from our own ignorance. Thank God we have a true expert in our midst; someone who truly knows everything there is to know about movies and can help us to know the good ones from the bad ones. I disagree, I thought the special effects were awesome and the Drillbot looked cool as hell, its what Bay did with it that I didn't much care for and I thought Soundwave actually looked incredible the attention to detail was awesome, but I do agree that Q looked dumb and I don't care for new names either, there's plenty of original names to go around. I think where going to be stuck with Bay forever. I honestly have no doubt Bay will do a 4th film. I'd actually be suprised if he does Pain & Gain before a 4th Transformers movie...remember, he's talked about doing it after Transformers and ROTF as well. What other movie property is going to indulge Bay with all of the things he likes to throw into a movie; CGI, pyrotechnics, live-action stunt gags, hot girls, a lot of characters, on-location shooting. Not to mention the huge amount of cash he stands to rake in. I expect to be seeing a 4th Transformers movie, directed by Bay in the summer of 2014.
as a big fan of Bay and the first 2 films I was heavily disappointed int he 3rd film...the ending, which should have saved the film proved to be the death nail.